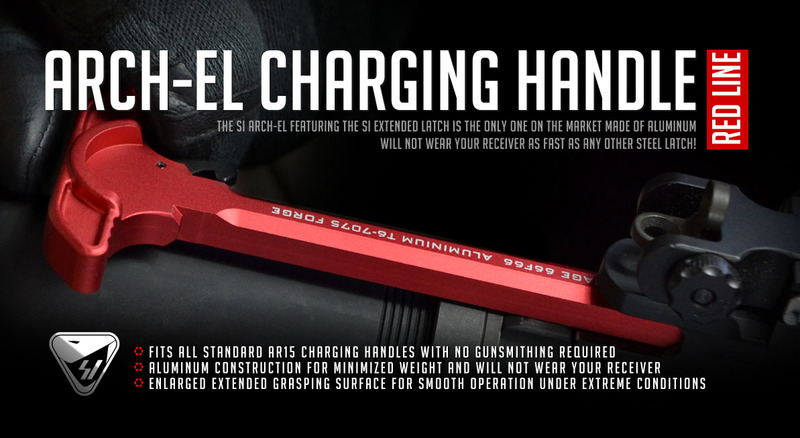 The new ARCH-EL Charging Handle from Strike Industries is a T-6 7075 forged hard anodized charging handle featuring a larger aluminum latch surface that functions with ease in adverse conditions. The SI ARCH-EL featuring the SI Extended Latch, only one on the market made of aluminum, will not wear your receiver as fast compaired to any other steel latch! With its high polished surface, its ergonomic design makes for a smooth, clean charge. The quality of the ARCH-EL is second to none and it’s built for durability. Once you place the ARCH-EL on your rifle, you will see, feel, and know the quality of the ARCH-EL! The Red charging handle is sweet to look at and noticeably smoother to charge. Very happy with the product.